Dolphin's private vehicles pick guests up at the St. Thomas airport. We are ready to help you get your vacation started immediately with cold beer and water onboard. Our drivers connect you directly to the boat and crew. Our land transfer fleet extends to Tortola as well for those guests needing to move on to a hotel after customs clearance. Customs Documentation Completed In Advance. As part of Dolphin's full service, our crew will complete your BVI customs paperwork in advance so you don't have to! This saves between 15 and 30 mins of BVI customs entry processing time. Dolphin is the only USVI operator licensed to go to any point within the BVI after customs clearance. Any other providers are only allowed to go as far as the few main BVI customs houses by boat. 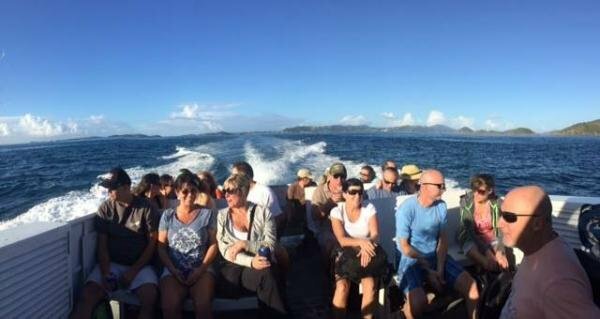 Dolphin can get your group anywhere they need to go in the BVI by boat after inbound customs clearance. Avoiding The Larger Public Ferrys. For what amounts to approximately an additional $50-$60pp, you can reserve your trip with Dolphin and avoid the public ferrys and related long lines, longer customs clearance times, unreliable schedules, or full boats (weekends). Going privately, is even MORE attractive after an already very long travel day. Don't get stuck overnight on St. thomas if your flight is running late! Dolphin is the only boating company in the USVI offering after-hours clearances. We are ready to go on your schedule, as soon as you land, even if your flight is late. Many flights land between 3 and 3:30pm leaving no room for delays - travellers often miss the last ferry scheduled out of St. Thomas to Tortola at 4pm. Award Winning Service & Staff. Dolphin Water Taxi is rated the Best Water Taxi/Charter by Best of VI for good reason. We have excellent customer support, and a more personalized service than any other provider. Once you land at the airport, you are with us the rest of the way...just sit back and relax and have a cold one. We'll do the rest!